Or—why territorial claims in the East and South China Sea are so contentious. The Council on Foreign Relations has put together a slick interactive guide to China's maritime disputes, placing them in geographic and historical context. Here's a map showing which countries are involved—and what they claim. China regards the huge area falling within these dashes as a “core national interest,” and for good reason: The South China Sea alone is believed to contain 11 billion barrels of oil and 190 trillion cubic feet of natural gas, a lot of which is located near the three archipelagos pointed out on the first map: the Senkaku/Diaoyutai, Spratly, and Paracel Islands. Unsurprisingly, these three territories form the core of China's disputes. Naturally, other countries disagree with China's geographic definition. And international law, in theory, backs them up: The United Nations Convention on the Law of the Sea (UNCLOS), signed in 1982, limits national territorial claims to 200 nautical miles from a country's coastline. 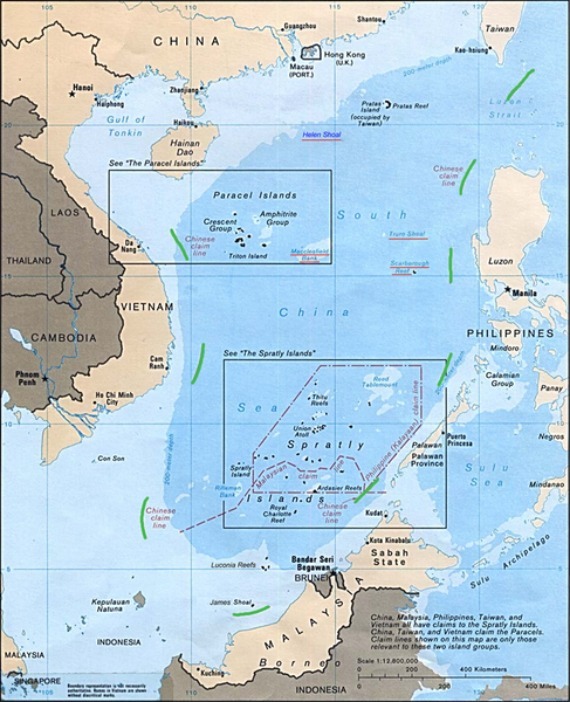 Countries like Vietnam and Brunei believe that China's expansive “nine-dashes” framework, which appears on maps in every Chinese passport, encroach on their respective “exclusive economic zones.” The Philippines early this year even launched an arbitration case against China, marking the first time a country has invoked UNCLOS in order to check Chinese aggression. What makes the South China Sea conflict so interesting is that it serves as a microcosm for today's most important global trends. There's the rise of China. The (relative) retreat of the United States. The fragility of international treaties. And, not to mention, the enduring thirst for oil and natural gas. One thing is clear: The resolution of China's maritime disputes, however it happens, will have implications far beyond East Asia.